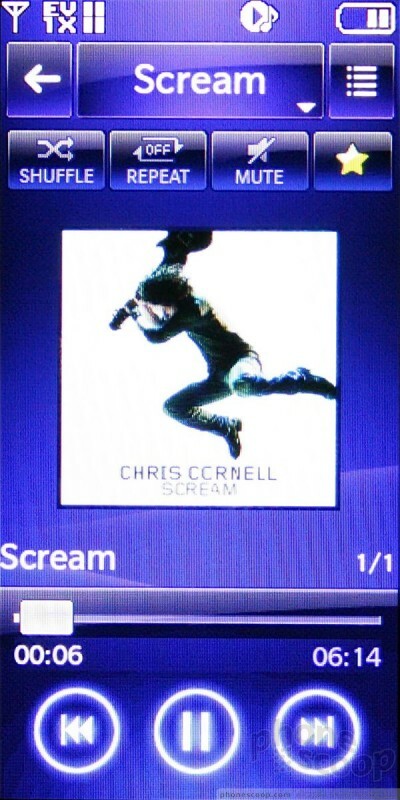 The music player is found in the shortcut menu or through the main menu, or you can place a shortcut on the media home screen. 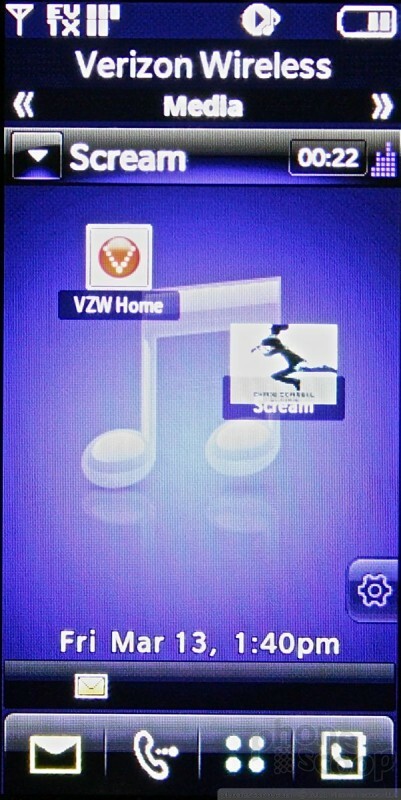 It has the typical links to Verizon's V CAST music store, where you can download songs. The Versa also has the Rhapsody client on board if you wish to join that subscription service. The main screen in the my music app hosts a number of different buttons. 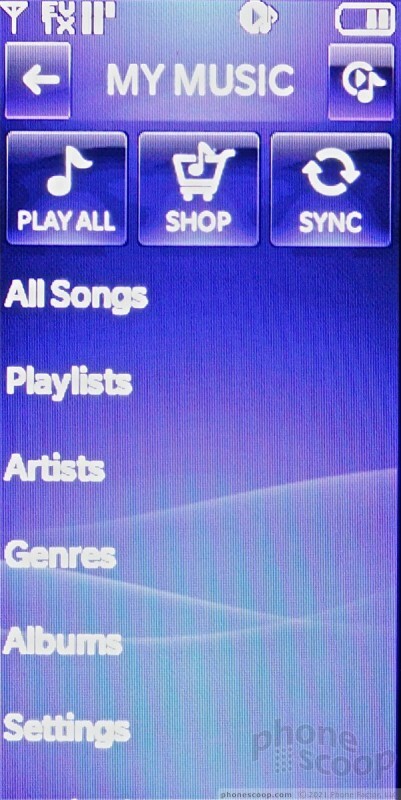 Across the top are three big buttons: play all, shop, and sync. Below them are buttons that allow you to sort through your library via artist, playlists artists, etc. You can also find the music player's settings menu buried at the very bottom of this screen. Once you've started playback, the player shows album art, and has easily used buttons for jumping forward/backward and play/pause. There is also a mute button, which I really happen to like, and then buttons to set repeat and shuffle. 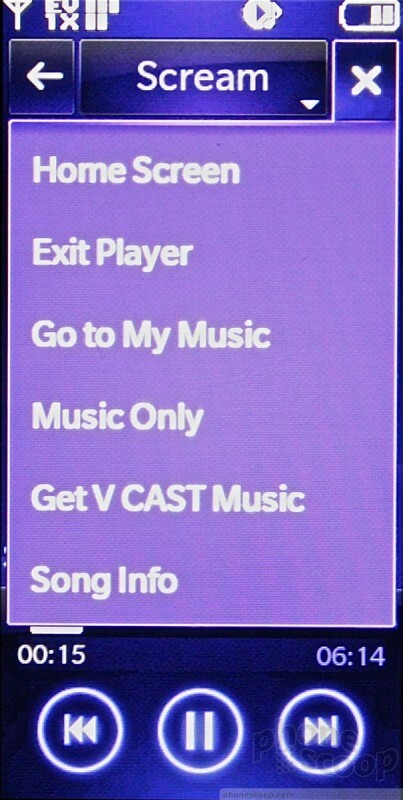 The option menu on this screen lets you go to the V CAST music store, to the home screen, as well as a few other things. If you happen to go out to the home screen with music playing, a little progress bar appears at the top of the screen that tells you what you're listening to and acts as a shortcut back to the music player. The music sounded pretty good through the phone's speaker. The inability to attach regular 3.5mm headsets is a bit of a pain. Stereo Bluetooth headsets were really the best option, and there was a definite improvement in sound quality when compared to the Versa's call quality.